A lawn can be affected by various diseases and conditions, the development of which is primarily related to climatic conditions. Early diagnosis of a lawn disease or condition can substantially help limit potential damage. This way, adequately caring for your lawn becomes ecological as well as economical. A lawn is maintained by sowing and topdressing bare areas, watering and flattening the lawn with a lawn roller if there is a presence of harmful insects and by choosing one of our fertilization programs to maintain a thick and healthy lawn. Yellowish-bronze irregular-shaped patches on the lawn that vary from 2 inches to several feet in diameter. Mostly in the spring and late-summer on areas that are poorly drained. It peaks in very hot and humid conditions (28°C +). Anthracnose (Colletotrichum cereale). Anthracnose of turfgrass is a foliar disease or a basal rot of the lower stem found under many climatic conditions. 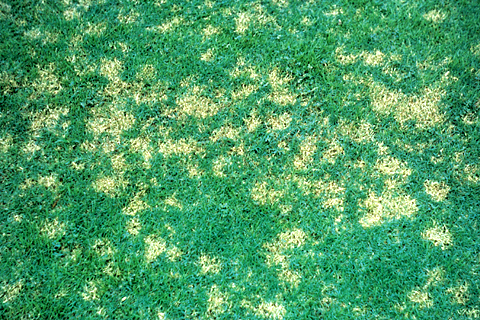 Anthracnose foliar damage appears as irregular yellow or bronze patches of a diseased lawn surface. Symptoms on individual plants first appear as yellow or red lesions on the oldest (outermost) leaves, then progress to a damage of younger leaves and shoots. 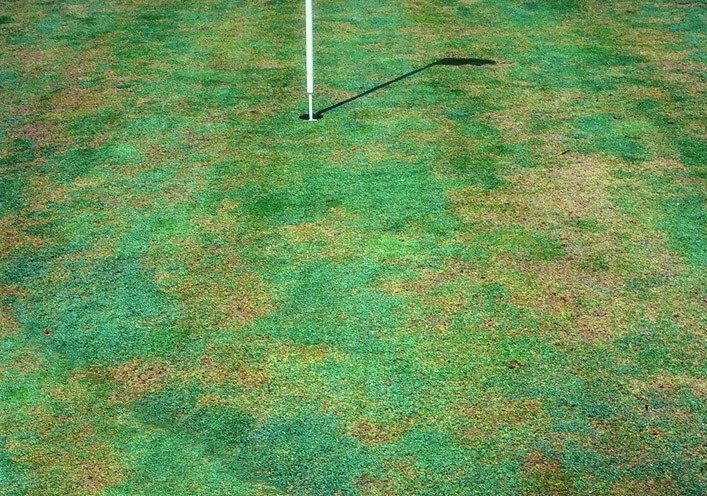 Anthracnose basal rot symptoms vary depending on the grass species affected. 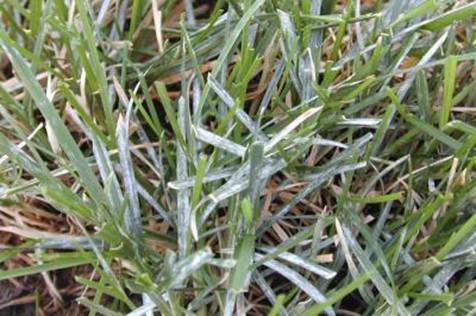 On annual bluegrass, symptoms appear as irregular bright yellow patches. 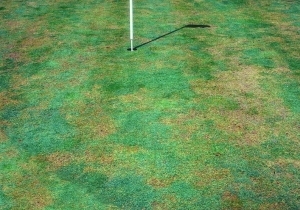 Affected bentgrass turf typically appears as irregular red or bronze patches and rarely appears yellow. On individual plants affected with anthracnose basal rot, a dark brown or black color is present at the base of the plant. Anthracnose is likely to occur when plants are growing slowly (during periods of hot and cold temperatures), during overcast periods, and in high humidity conditions. Choose one of our fertilization programs, which will keep your lawn dense and healthy. Keep your lawn height at a minimum of 3 to 3.5 inches. Do not mow a wet lawn. Presence of a powdery white substance on the lawn. Patches of lawn that have a powdery white substance on grass blades. The disease is usually associated with poorly drained or over-watered areas. Spores of the fungus-like organism (Sclerophthora macrospora) move via free water. Powdery mildew can appear quickly on a lawn, mainly in shady areas and more frequently during cloudy or overcast periods. Clear areas that are very shady, if possible. Topdress and overseed (with seeds specifically for shaded areas) the affected patches that are sparse with grass. There is no fungicide that can control this disease. 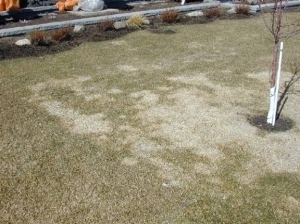 Presence of grayish or pinkish patches on the lawn. Grayish or pinkish patches, 3 inches to 1 foot in diameter, that appear on the lawn. In winter on a lawn surface that is not frozen or in the spring, while the ground is thawing and the snow continues to melt. Snow mould is a type of fungus and turf disease that damages or kills grass typically in late-winter, especially when snow is slow to melt. If the lawn is healthy, the mould, which resembles a grayish intertwined spider web, will disappear quickly once the lawn is raked. The damage, if any, is minimal. If, however, the lawn is in poor condition, the grass in the affected areas will die, leaving bare patches behind. The last mow before winter must be done well before the first frost and the grass should be left at a height of 2.5 to 3 inches so that the lawn is protected from frost. It is essential to remove grass clippings after the last mow of the season in order to allow the lawn to breathe. Never mow the lawn after the first frost, so as to maintain the ideal height. Topdress and overseed the affected areas in the spring. Ring of dark green grass. The appearance of a dark green zones 2 inches to 1 foot in size that form circles of 2 to 15 feet in diameter. Mushrooms may also appear after it has rained. All throughout the season. Between the months of May and September, depending on atmospheric conditions. Mushrooms may appear as well. Fairy rings also known as fairy circles or elf rings. They are usually noticeable after heavy rains when tan mushrooms appear in a ring-shaped pattern or during regular weather when circular or semi-circular areas of dead/dying turf appear. These areas have a margin of darker green turf just next to them. These darker areas are due to the fungus releasing nitrogen. 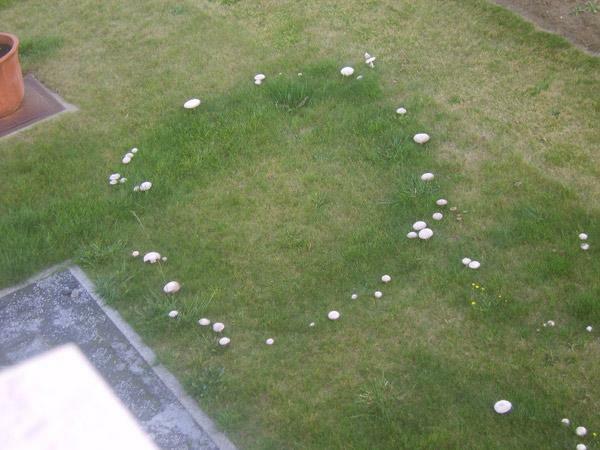 As the rings develop, they grow outward and down – the fungi can extend down into the soil several feet. Fairy rings are spread either by spores or infected soil. Water your lawn regularly (once a week). Keep your lawn height at a minimum of 3 to 3.5 inches and remove and dispose of infected grass clippings. Dig up the affected areas and replace the soil and grass. Grass that yellows and dries out, followed by the presence of scorched patches. From May to October, peaking in autumn or in persistently humid conditions (shaded areas, too much watering, lingering dew or poor drainage, etc.). 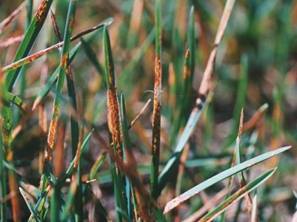 Rust is a fairly common lawn disease caused by fungus. Rust usually appears in shaded areas first, during warm humid weather. 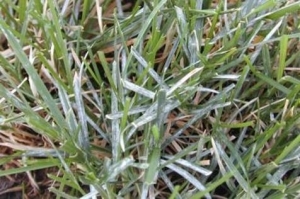 The fungi symptoms of this lawn disease begin as tiny yellow spots on the grass blades. These spots become elongated and eventually rupture into clusters of rust-orange spores that give the disease its name. When touched, the powdery dust-like rust spores leave a colour a lot like the fine particles of rust from metal. Rust spores are tiny and very lightweight. They can be carried long distances by the wind, which means that even the best kept lawns can be infected. Presence of round spots on the lawn. Clearly delimited discoloured spots that are green to brown in colour and 2 to 5 cm in diameter, reaching up to 15 cm. In the case of a strong attack, spots may converge. 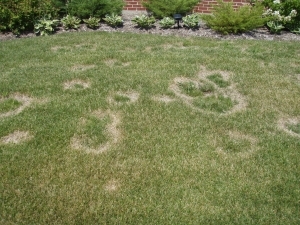 Affected areas clearly stand out from remaining healthy lawn. A spider web looking mould appears on the lawn when the humidity level is high. Spring and autumn, during the lawn’s main growth period. The grass stem dries out from the middle. The mould (mycelium) can also produce a toxin that blocks the root system, which causes the plant to quickly dry out. Water regularly (once a week). Topdress, overseed and add potassium. Presence of yellow rings on the lawn. Circular patches that are 6 inches to 1 foot in diameter, within which a small patch of green grass can often be found. Caused by the fungus Leptosphaeria korrae, in its advanced stage the damage takes the form of rings or crescents of dead grass. Cool wet weather promotes its growth in spring and fall, but the dry hot summer reveals its arcs and rings more blatantly by attacking the roots. Water often during dry periods. Dig approximately 2 inches outside the rings, removing between 6 to 10 inches in depth and making sure to dispose of the soil and grass removed. Topdress and sow new grass seed or lay down sod strips. Peace of mind at a low price! We offer the most complete fertilization programs in the industry.